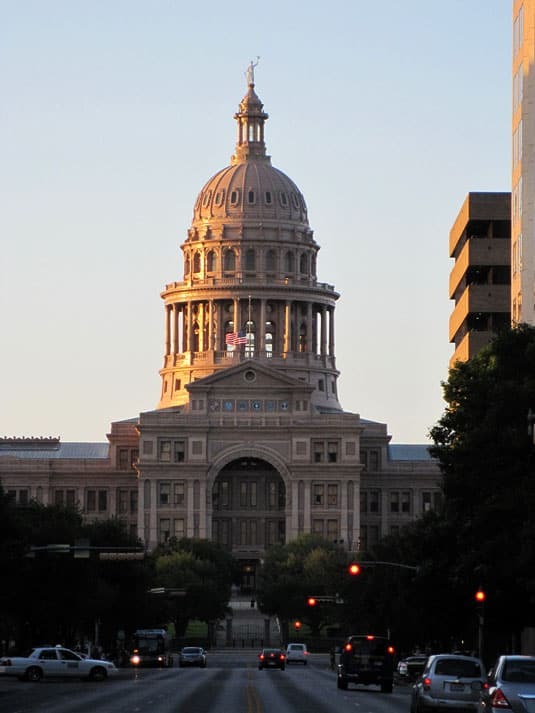 I’m just coming back from Austin, Texas, where I attended the International Association of Culinary Professionals (IACP) annual conference. For those of you who don’t know the IACP, it’s a “professional society of individuals employed in, or providing services to, the culinary industry.” I became a member last fall, after Stephanie (Wasabimon) convinced me it was the best all-round association for food professionals and that the annual conference was not to be missed for the learning and business opportunities it provides. As soon as I became a member, I realized I now had access to an incredible wealth of knowledge. I was amazed at the other members’ experience and felt proud to be part of this new community. 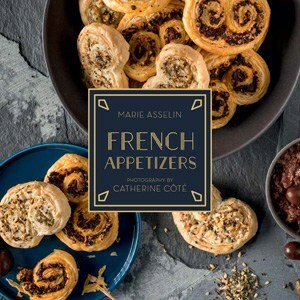 I also felt it kind of “legitimized” my food blogging hobby and confirmed the choice I made to target my graphic design and translation services toward the culinary industry. A week ago, I flew to Austin for the long-awaited conference. After hearing such good things about the annual conference, and attending a regional IACP conference in New York last February, I had high expectations. The event spanned over four full days, and my schedule was composed of sessions that all promised to teach me something new. The speakers list was impressive, featuring A-list bloggers, authors, chefs, photographers and food professionals. I expected to be star-struck and entertained, to learn lots and to have fun. Today, I’m happy to report that the conference lived up to the hype. The organization and management of events was top notch, sessions went deep under the surface, attendees were kind, infinitely interesting and always open to meet and hang out with someone new. I learned a lot, met amazing people and made incredible business contacts. I’ve come back home with renewed motivation and a long list of project ideas that will fuel my career and business development for the next year and beyond. Had a life-changing educational session about Adobe Lightroom. Benefited from informed recommendations and wise tips given by an amazing teacher. Was lucky to attend an intimate session led by a passionate story-teller. She showed genuine interest and investment in everyone’s personal story and career aspirations and provided generous advice. Discovered the video blog A Perennial Plate and its creators’ amazing reporting talent; was mesmerized (once again) by Penny’s stories and photographs, and laughed a lot, thanks to Kim’s witty quotes and her legendary interviewing talent. Daniel Klein (The Perennial Plate), Penny De Los Santos, Kim Severson: Finding & Crafting a Great Story. Saw and met talented, award-winning Amanda Hesser for the first time and enjoyed a demonstration (and yummy tasting) by the legendary man who hosted the first cooking show I ever watched. Heard the infinitely generous Dorie and let her contagious enthusiasm reach my heart, and learned more about the way electronic books and apps complement (not replace) cookbooks, from the publisher’s perspective. Heard Lisa’s objective and practical advice and viewed interesting statistics about readers and bloggers today; met two very successful star-bloggers who shared their story, experience and advice. 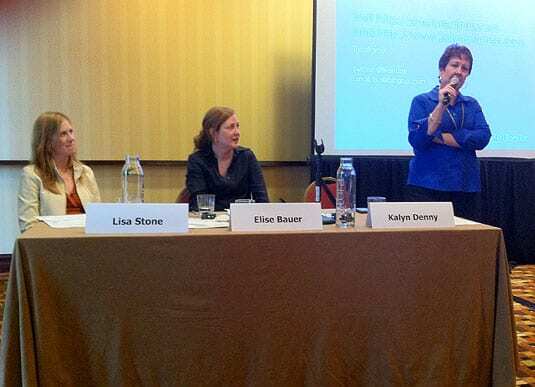 Lisa Stone (BlogHer), Elise Bauer, Kalyn Denny: Food Blogging, Beyond the Basics. Learned how to see and understand light in a different way, which will enable me to become a better photographer. 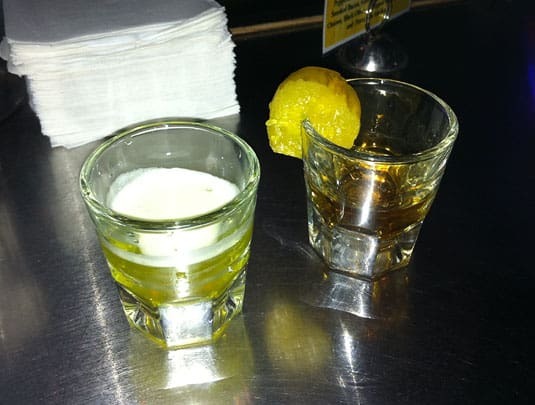 Pickle-Back Shot: A shot of Whiskey washed down by a shot of pickle juice. It’s weird, but it kinda works! Having show-worthy Flaming Dr Pepper shots (check out the video!) at Touché Bar on 6th street and late-night slices of delicious piping hot pizza from a truck with Rachel, Rev and Kristen. You’ll understand that I’m coming back from Austin happy, touched and changed. 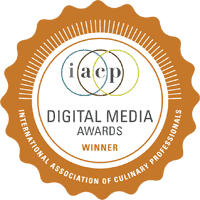 I will be a proud IACP member for a long, long time. P.S. Stay tuned for fabulous signed book giveaways! Coming up this week. P.P.S. For those of you who missed the conference, a video pass is available so you can watch 34 of the best sessions online for $69.99. This is the list of people that I met and shaken hands with at the conference. There were hundreds of other professionals at the conference. I hope to meet them at the 2012 Annual Conference in New York! Benjamin Rhau, blogger, You Fed a Baby Chili? Rachel King, blogger, Blinded by the bite! Better late than never! Great recap..an inspiration for future conferences. Thanks Mary, happy you stopped by! Can’t wait to see you again, either this summer in New England (or Canada even, who knows…) or in NYC. Marie, What an excellent recap you’ve written! What’s incredible about the conference is how much we all got out of it, and, still, one couldn’t possibly take everything in. Hence, the beauty of the online video pass – it will take *weeks* to be fully caught up on all of the sessions! This is such a great re-cap of the event, I feel like I am reliving it! P.S. I am totally intrigued by the whiskey and pickle juice…might need to have a drink before I am willing to attempt that one! Marie, this was a really nice recap and thoughtful post. So kind of you to list everyone you met! You were always smiling when I saw you. I love your shots of the speakers! Thanks for a great read. Hope to see you again soon. Thank you for visiting Shef, I hope we’d have more time to chat. Indian food is one of my favorite cuisines to make at home, but I still have so much to learn. I will definitely be reading your blog, I’m sure it’ll help me get better! So glad you had such a good time at the conference. Good to get some feedback on it, I have been thinking about attending but was not sure. It is good to be inspired and meet such wonderful people. Thanks for sharing. I too was a bit hesitant before going. Adding up the conference, flight and hotel costs makes it a pricey activity, but if I have to save to attend just one yearly conference, this will be the one. I hope you’ll consider going to the 2012 IACP conference in New York next year! I was so happy to put a face to a name. That’s one of the things I like best about these conferences — meeting people in person, especially someone who comments so often and so thoughtfully on my blog. Thank you again for that. 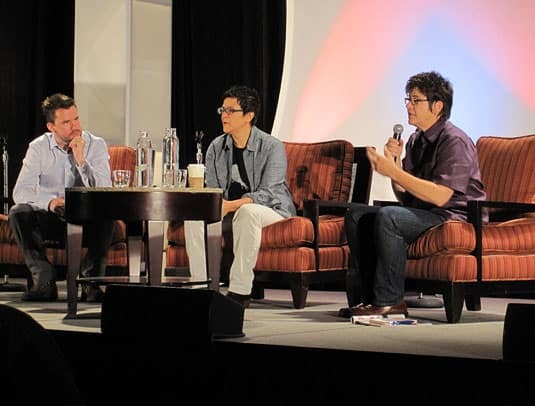 And thanks for a thorough write-up of the conference and gorgeous photos. I’m just back from Austin now and have yet to do the same. Thank you for visiting Dianne, I feel honored! The conference seemed to have inspired many of us, from what I can tell by the recaps I’ve read so far, and I can’t wait to read your impressions as well. I’ll definitely be in NYC – time and again, being at IACP has proven to be too valuable to miss! And thanks so much for checking out my site and for your compliments. I’m impressed with yours – so jam-packed with information! How do you find time to sleep??? Marie, what a fantastic write up of the conference! We were in many sessions, I see, by your list but somehow we did not meet. I’ve smiled all the way through reading your post, wishing I had taken more pictures. I was listening so intently and taking notes (15 pages!) that I hardly thought about photos. It was our first conference too, and we already have NY on the calendar. What an amazing, kind, helpful, gracious group of people. As you said, I too felt “legitimized” by being a part of this group, feeling like I actually belonged, and that’s after starting my personal chef/catering business 5 years ago and my blog 1 1/2. Wish I had joined sooner, but all thing in time as we grow.I was on “wow” mode most of the time. Thanks again. Need to take lots of photos in NY next year! The learninga nd meeting everyone was incredible. I too was fast writing in my notebook – and tweeting and taking pictures! I couldn’t take everything in but I sure did my best. I have re-read my notes on the plane as I was writing my post and could hardly believe everything that I learned. It’s very unfortunate that we didn’t meet! Let’s keep in touch through our blogs and meet in NY next year, shall we? P.S. I have just seen the Baby Back Ribs picture on your blog, how luscious! 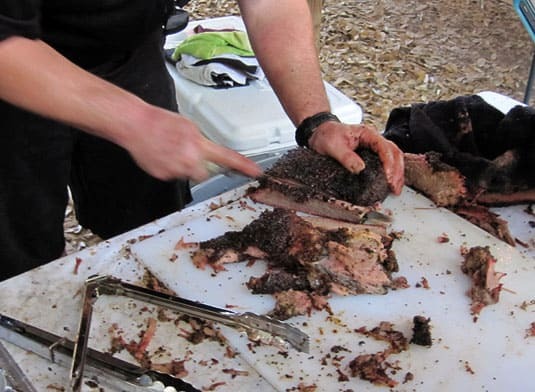 After enjoying so much meat in Austin, I feel like I should cook more at home (something I rarely do). Your ribs are certainly inspiring, I’m saving this for the weekend! I’m sorry we didn’t meet at the conference, Marie, but appreciate the opportunity to get another cut at it through your experience. And – totally jealous about those flaming Dr. Pepper shots! I’m sorry too! There were so many interesting people over there, four days wasn’t enough! Let’s make a point to meet in New York next year (hope you’ll be there!) 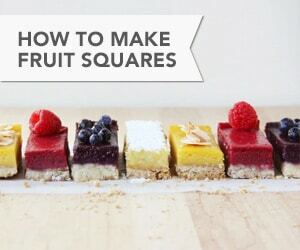 I just visited your site and I love it, it’s so bright and fresh! I can’t wait to read through it to learn more about you. And I need your pairings books, choosing wine is always something I struggle with! As for the Dr. Pepper shots, they were sure worth the trip to Austin. Never seen anything like this in a bar before! They were dangerously good too – and I’m not a Dr Pepper or a Whiskey drinker to begin with! You must have read my mind! I too returned home from Austin with my culinary batteries recharged.I learned a lot and met people who I will be sure to stay in touch with. I want to know if the woman from Alabama makes a go of her sheeps’ milk cheeses. I will be a customer. I want to know that the photographer from Charleston, S.C. realizes his dream- maybe he can do the photography for my book. And,of course, I got pics of myself with some of my most admired inspirations. cant wait for Conference in N.Y. 2012. My mind also remembers moments or people in short snippets. I think we were so immersed in the world of food at the conference that we have to catalog everything that we tasted, everyone that we met, and all the conversations that we had in a way that we won’t ever forget what touched us deeply. I have met many people that had attended 5 or even 10 IACP conferences before – I can’t imagine what that does to your career and motivation to continue on with your passion! I can’t wait for next year and all the others to come. Thank you for coming by! It was wonderful to meet you in the “Blog to Book” session. Shauna deserves all of her success. She’s amazing!! I have been so inspired by the conference — my mind will not stop racing with new ideas. I’m so glad to hear you were touched, too. I think the “Expert” sessions were a wonderful way to form a closer bond with other participants. Shauna led it in the most perfect way, allowing everyone to present him/herself. 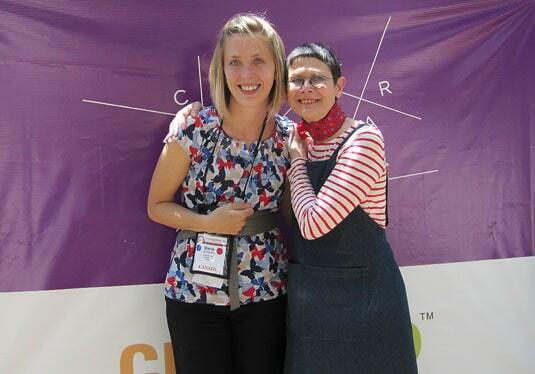 I’ve met amazing people and discovered fantastic blogs through her session – like yours! As I told you in Austin, I’m very unfamiliar with Southern foods so I will read through your blog with great interest. Thank you for your comment and let’s meet again in NY. Holy smokes – that was a fantastic, thoughtful recap of the most amazing week. I keep crying as I look through my photos of the conference. Woah – we all learned so much and had an incredible time. 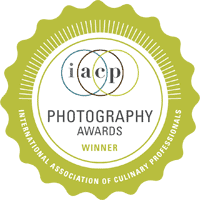 I am thrilled that Steph introduced you to IACP! I’m so happy that she did as well! I’ve been to conferences before, but I’ve never felt so inspired than by this year’s IACP conference. If it’s the same every year, it’ll be the event that keeps me going all year long! 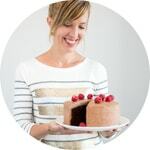 Just loaded your blog, looks amazing (I always love someone who takes time to teach cooking to kids) – I will definitely dip deeper into it! I hope we get the chance to meet in NY next year. Wow, what an impressive write-up of the conference. You were clearly more dedicated about taking photos than I was! 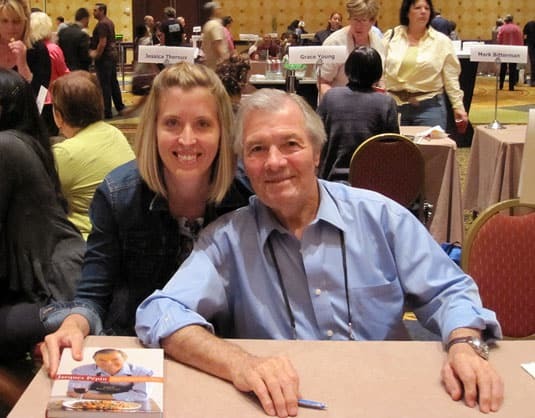 I so enjoyed meeting you in the Scott Martin workshop and then seeing you again a few times. Hope we will meet again, and I and just subscribed to your blog so I can keep up with what you’re cooking! Thank you so much Kalyn, you are such a lovely person, I was so happy I had the chance to chat with you in Austin. And your session! You are such a natural, I hope you’ll be presenting again in NY. How about a conf. for “advanced” bloggers? YES! Of course, after this year, wouldn’t miss it for the world! I just wish we had time to chat together, it seems like we kept on passing each other while going somewhere, didn’t we? Thanks for the informative post AND the tip about the video pass for those of us unable to attend. That was great! You’re very welcome! I thought the sessions were the most informative and in depth of all the conferences I ever attended. 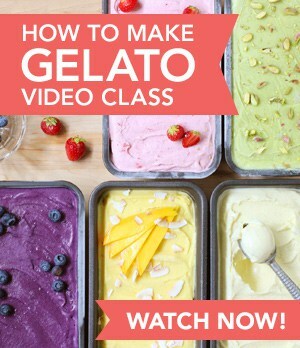 The video pass is a steal to get access to that knowledge! I may very well get it myself to watch the conferences I couldn’t attend (cannot be in two rooms at once, right!). This is a fabulous post Marie – succinct and to the point but so informative. Thouhg I am GREEN with envy about Jacques and Dorie though…. Thanks Mardi, wouldn’t it have been fun to chat together, Jacques, you and I? He seemed exactly the same as he was when I watched him as a girl. And Dorie – you met her before I think – she’s the best! What a great recap! The conference sounds like it was truly inspiring. And that picture with Dorie Greenspan is absolutely adorable! Thank you, I had such a great time! Dorie is the absolute most gracious woman in the world. Wow, what a thorough, informative post. I was there but didn’t begin to take in all that you’ve covered. And handy hotlinks, too–thanks! I’m happy that you came by Nancy, I just wish we met at IACP! I’m sure the opportunity will come along next year in New York. In the meantime, we’ll keep in touch through our blogs, I just visited yours and I’m impressed by your exprience! I can’t wait to read more of your posts.